So this week I treated us to some rosemary ciabatta, fresh mozzarella, and heirloom tomatoes from Fresh Direct. We had our splurge night but didn’t finish all the ingredients. 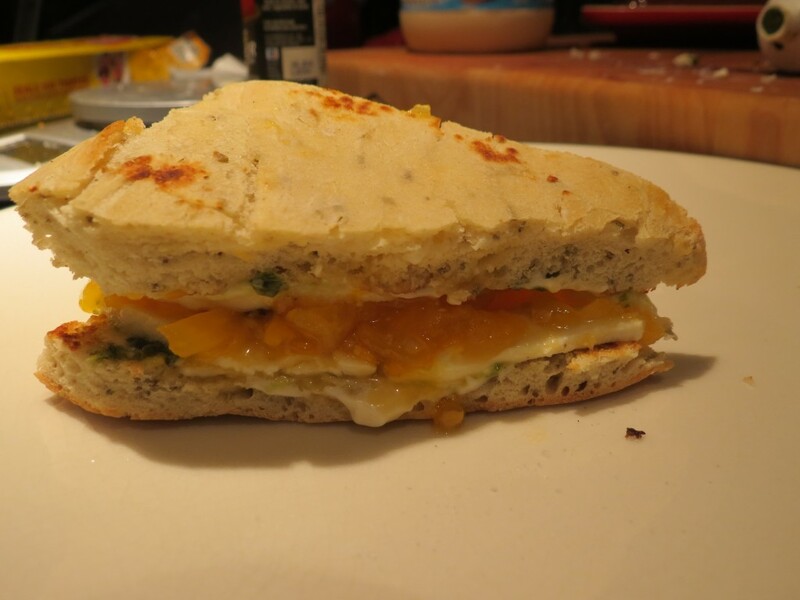 So a couple nights later when I was alone for dinner, I decided to create this panini inspired by our splurge night. It. Was. Incredible. There were a couple of things that I did that really took this panini to the next level. The first was pre-grilling the bread. Ciabatta can be very thick and I am sure you will agree with me in my immense distaste for hot sandwiches that are cold in the middle. So before I built my sandwich in any way, I spread butter on the bread and lay it face down in a skillet over medium heat for about 3-4 minutes until the insides got toasty and golden brown. This can also help you flatten the bread which will help your panini be more about the combination than a battle of bread vs. fillings. Remove your bread and turn off the heat. The second trick to this panini is flavored mayo. Sometimes my brother and I dream about making our own company and one of our many ideas is to bottle and sell my flavored mayo and yogurt. This is one of my favorite things to do because you still get the creamy indulgent feeling of mayo while using about half as much with twice the flavor. 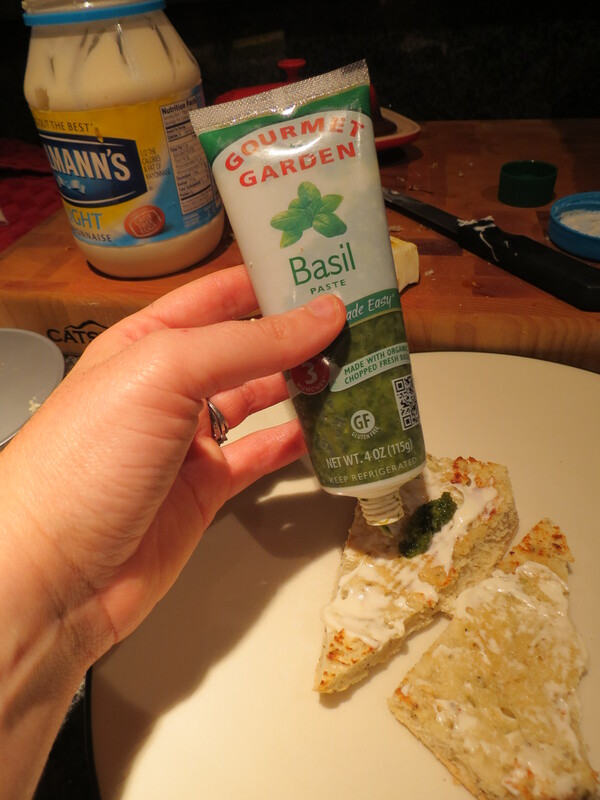 For the basil mayo I first spread some light mayo on the bread and then topped it with basil paste. Normally I would have mixed these 2 items together with some salt in a separate dish, which is what you should do if you are using fresh basil. Since this was a pretty small sandwich I skipped the pre-mixing. Next, layer on the cheese and tomatoes. It’s important to put the cheese closest to the bread when you are making a panini so that it can melt beautifully and evenly. I am all about symmetry in my sandwiches, so I put a slice of cheese on each slice of bread, followed by the tomatoes and a sprinkle of salt. Close your sandwich and stop your mouth from watering… you’re so close to being done! My final trick came about because I was too lazy to get the panini maker out, so I needed a way to get heat to both sides of the sandwich because it’s too thick to flip. 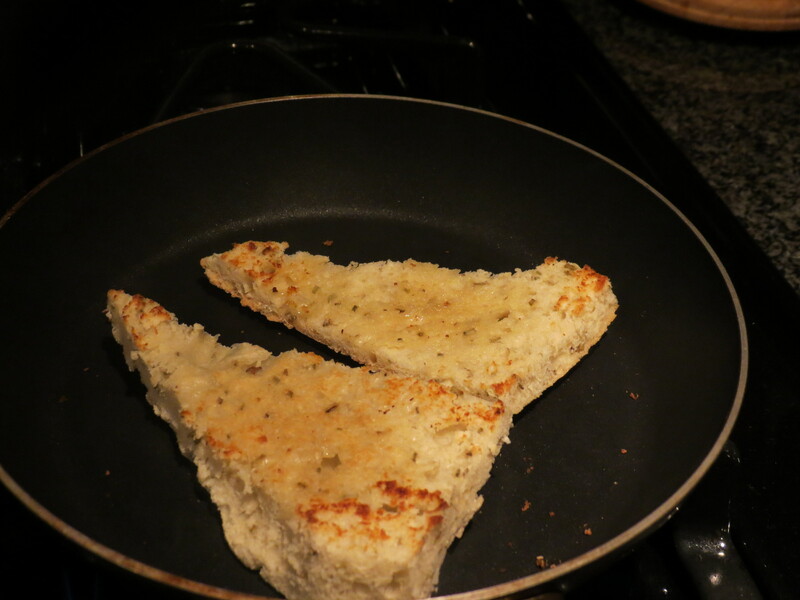 Return your panini to the skillet where you cooked the bread. No need to add any more butter or anything. Cover your panini with something metal that will conduct heat. I used the small baking tray from our toaster oven. You can also add something heavy on top to help press it down. 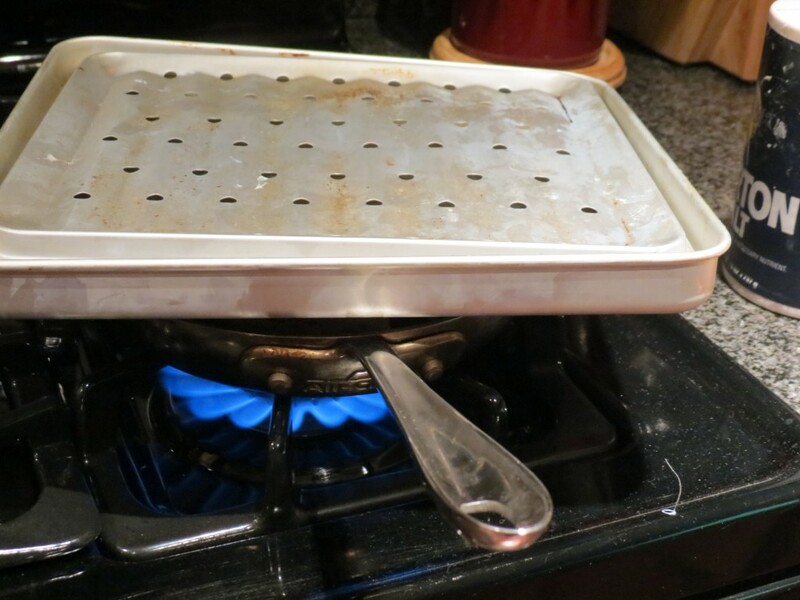 Be careful and remember that you picked something that specifically conducts heat so you will need a potholder to remove it once your panini is ready! I…. forgot about that part (ouch). 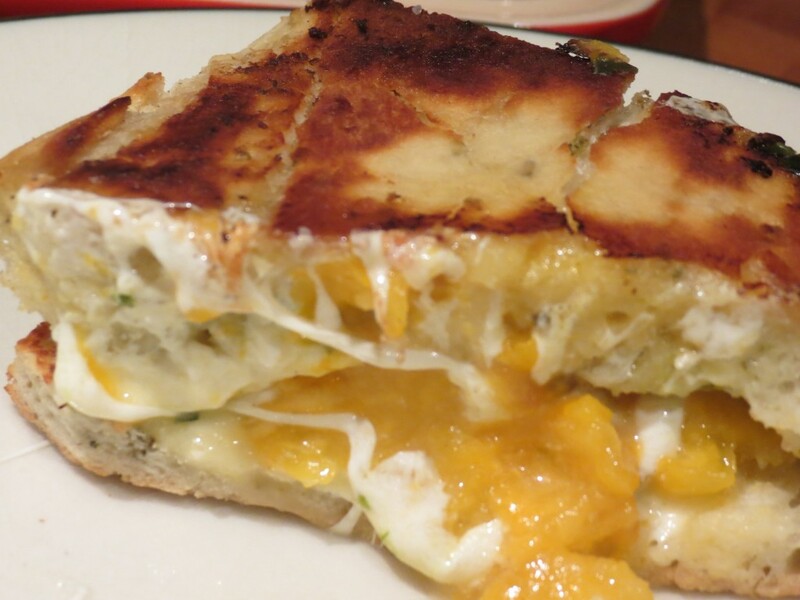 The panini will cook for about 5 minutes and then be ready for it’s closeup! This dish is so quick and simple to make and the combination of flavors: rosemary and basil with the mild acidity of the tomato and the creaminess of the fresh mozzarella really were pure, simple, perfection. I served this next to a giant salad because I was still feeling guilty about splurge night. It’s still summer for a few more weeks… go to the farmers market and make this panini for lunch or dinner… you won’t regret it! 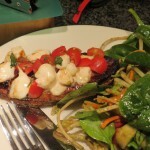 This entry was posted in Anytime, Dinner, Leftover/Makeover, Quick Bites by michcorbett. Bookmark the permalink.